RhydoLABZ’s GSM/GPRS Modem-RS232 is built with Dual Band GSM/GPRS engine- SIM900A, works on frequencies 900/ 1800 MHz. 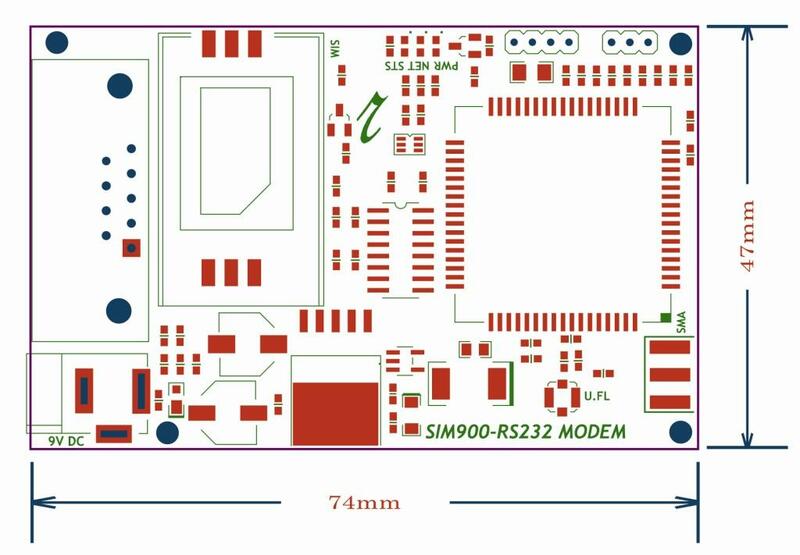 The Modem is coming with RS232 interface,which allows you connect PC as well as microcontroller with RS232 Chip(MAX232). 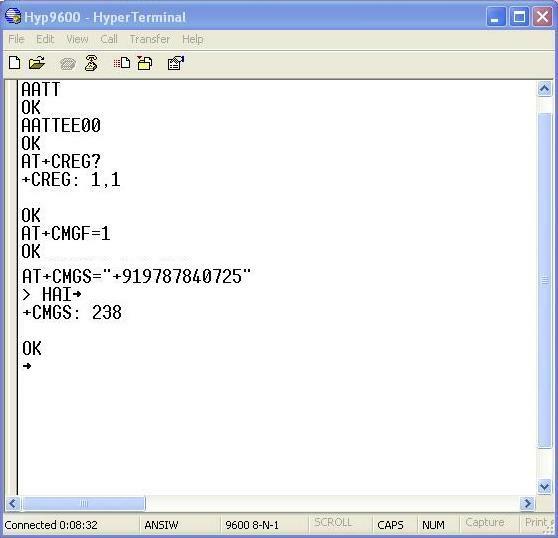 The baud rate is configurable from 9600-115200 through AT command. The GSM/GPRS Modem is having internal TCP/IP stack to enable you to connect with internet via GPRS. It is suitable for SMS, Voice as well as DATA transfer application in M2M interface. The Modem is manufactured with Automatic Pick and place machine with high quality standard.The onboard Low dropout 3A Power supply allows you to connect wide range unregulated power supply . Using this modem,you can make audio calls, SMS, Read SMS, attend the incoming calls and internet etc through simple AT commands. The SIM900A is a complete Dual-band GSM/GPRS solution in a SMT module which can be embedded in the customer applications allowing you to benefit from small dimensions and cost-effective solutions.Featuring an industry-standard interface, the SIM900A delivers GSM/GPRS 900/1800MHz performance for voice, SMS, Data, and Fax in a small form factor and with low power consumption. With a tiny configuration of 24mm x 24mm x 3 mm, SIM900A can fit almost all the space requirements in your applications, especially for slim and compact demand of design. Inbuilt Powerful TCP/IP protocol stack for internet data transfer over GPRS. Make sure your SIM card is unlocked. 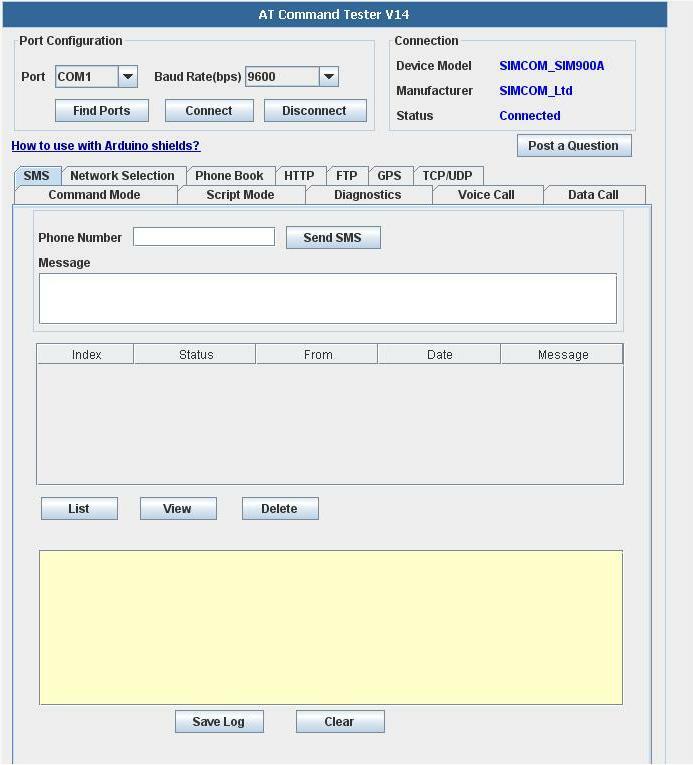 Default factory baudrate for Rhydolabz GSM/GPRS RS232 MODEM-SIM900A is 9600. Make sure that the Input Voltage is between 4.5V-12V DC. 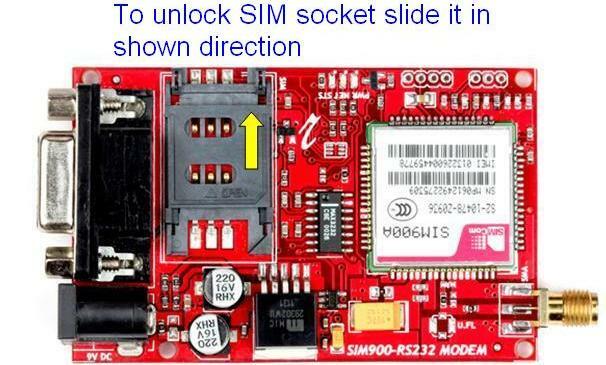 Insert an unlocked SIM card to SIM card Holder. 6 Pin Holder for SIM Cards is provided on the Modem. Close SIM card Holder.Both 1.8 volts and 3.0 volts SIM Cards are supported by SIM900A – the SIM card voltage type is automatically detected. Connect serial cable to the modem. 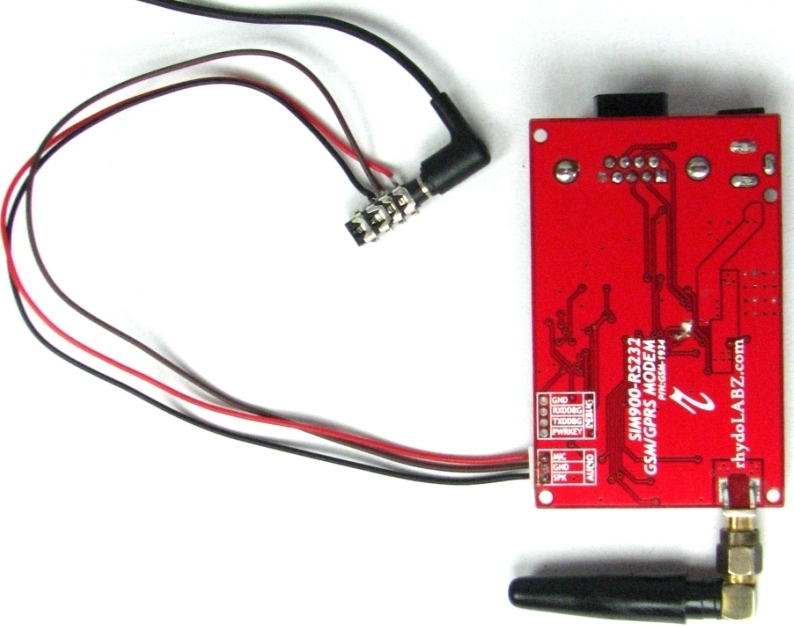 Give power supply in between 4.5V to 12V through the power jack provided. Default factory Baudrate is 9600. When the modem is successfully powered-up, the PWR LED (RED) on the modem will be ON, the STS LED (GREEN) will light after 1-2 seconds and the NET LED(BLUE) will blink every second. After the Modem registers in the network (takes between 10-60 seconds), this LED will blink in step of 3 seconds. 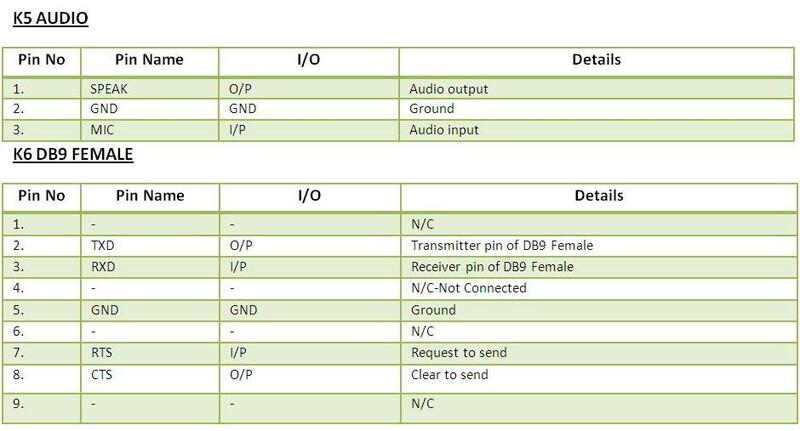 The Network LED indicates the various status of GSM module eg. Power on, Network registration & GPRS connectivity. When the modem is powered up, this NETWORK LED will blink every second. After the Modem registers in the network (takes between 10-60 seconds), this LED will blink in step of 3 seconds. 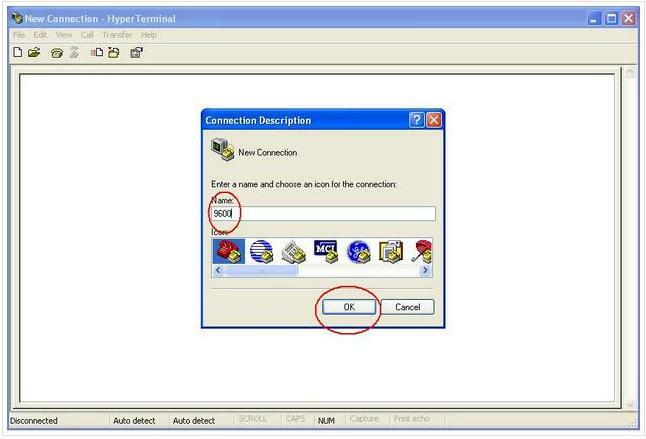 At this stage you can start using Modem for your application,showing that modem is registered with the network. 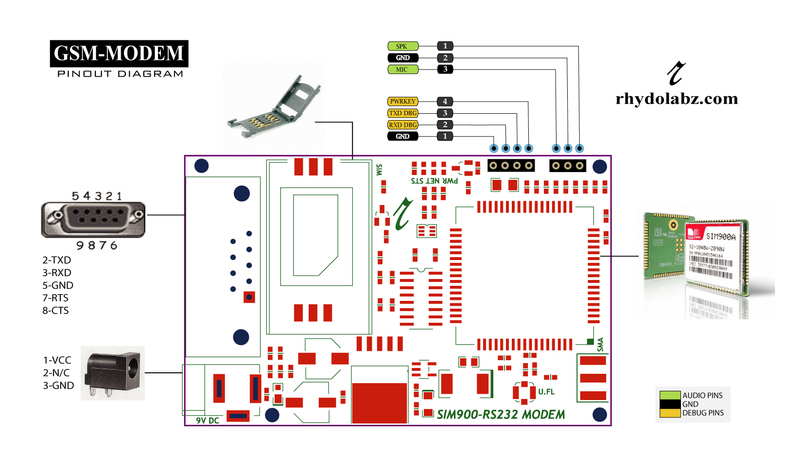 You can directly connect RhydoLABZ GSM/GPRS RS232 MODEM-SIM900A modem to your PC through serial port, no need of any interfacing modules. 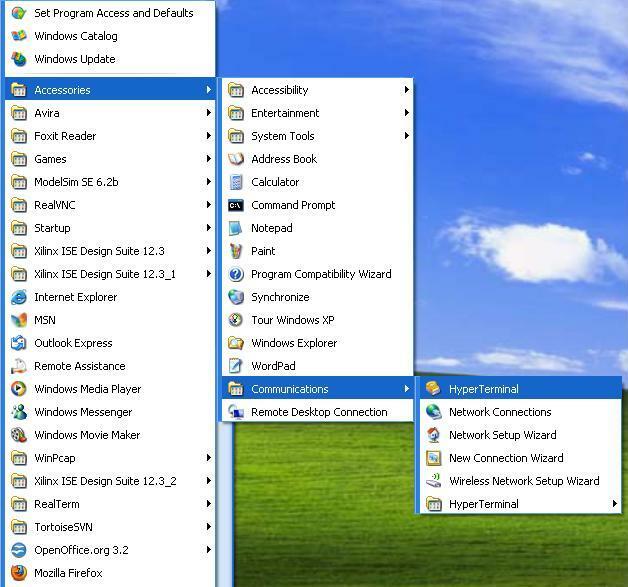 If serial port is not there in your PC (some laptops doesn’t have serial port interface) then you can use USB to Serial Adapter (DB9) for this purpose. 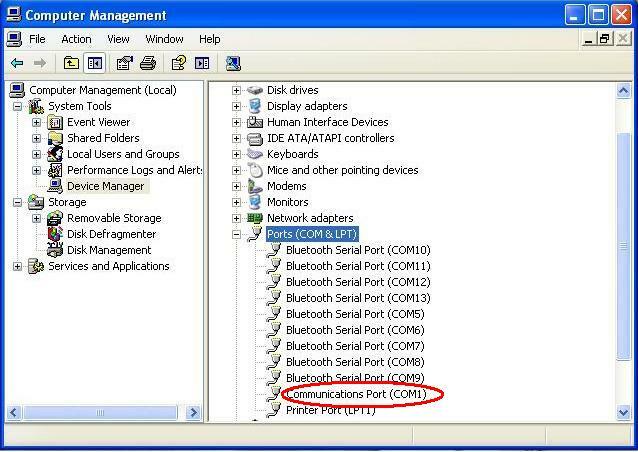 Once you are done with all these procedures, check appropriate COM port that got assigned to the Communication Port in your system by looking into the device manager like as shown below. In case we are having window XP OS and not having window terminal in it, then we need to create a new window terminal for checking our Modem using PC. 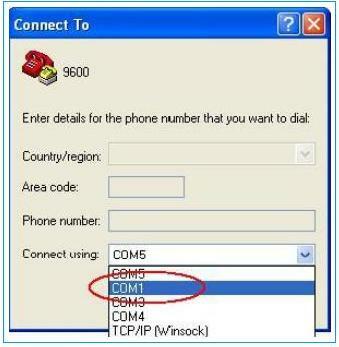 Now you can give an appropriate name to the connection like 9600 and click OK.
Also Select the appropriate COM port when asked for, in our case most probably it would be COM1. 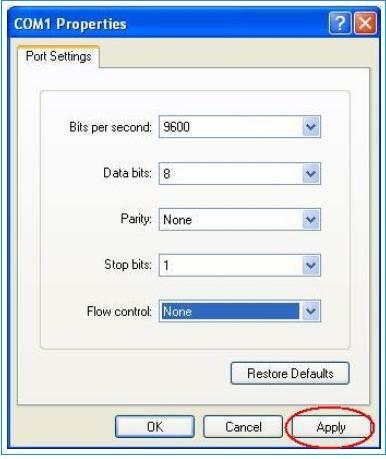 Ensure that you have kept the settings like Baud rate which should be 9600, parity none ,data bits 8 and stop bit 1 and flow control can also be kept as none. You can simply use Hyper Terminal. After you click apply and OK you will be shown the window below,By default it would be disconnected, Simply Click on the Highlighted button to connect. Now let’s try to check our Modem with AT commands for that we need to send following AT commands to Modem as shown below. 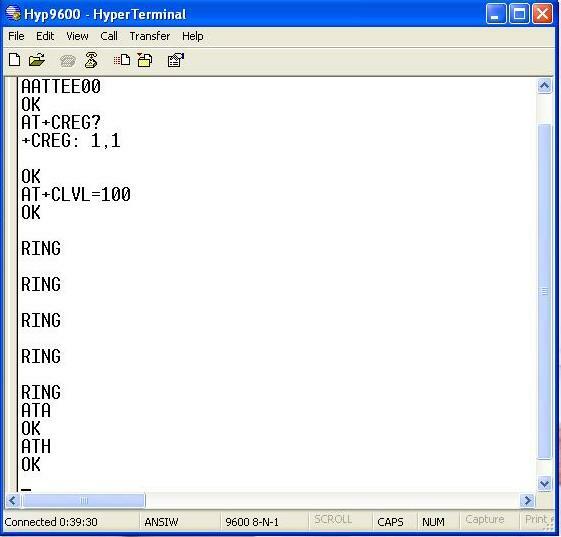 The above shown command :AT command (followed by enter) after “OK” response, this signifies that our Modem is working properly.ATE0 command (followed by enter) is being sent to stop the echo. AT+CREG? (followed by enter) is being used to check whether the SIM got registered or not. 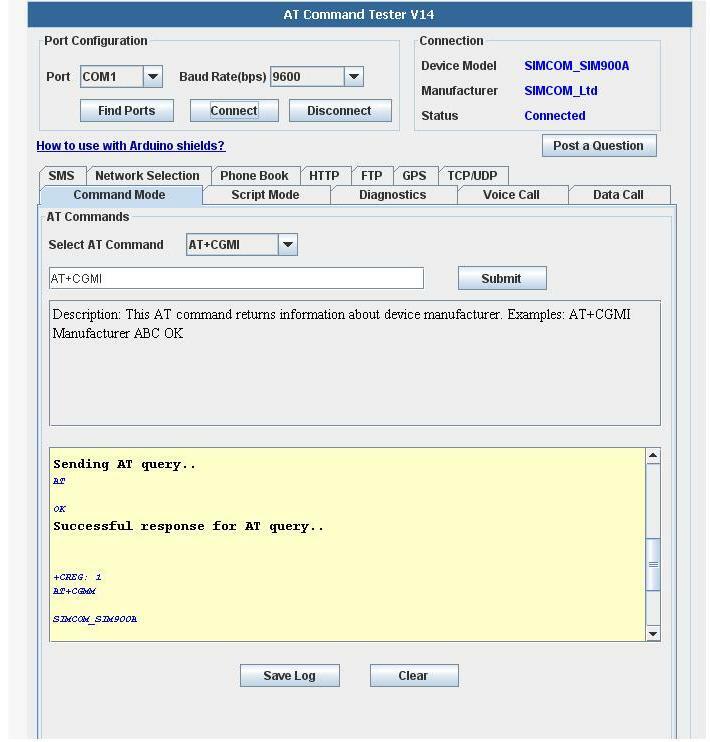 To get complete application note on AT commands click here. 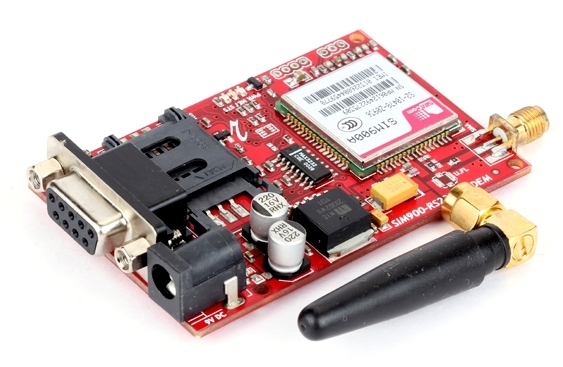 Now next let’s send a message using rhydolabz GSM/GPRS RS232 MODEM-SIM900A.For sending message we need to first send related AT commands to initialize the modem to send a message. 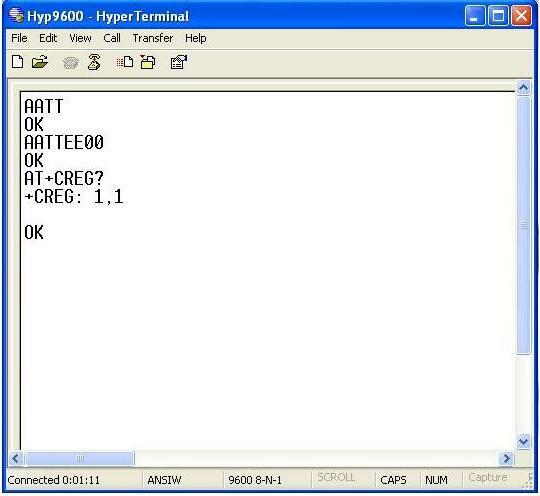 The AT+CMGF=1 command (followed by enter) sets the GSM Modem in SMS text mode. <CR> represents the carriage return character. 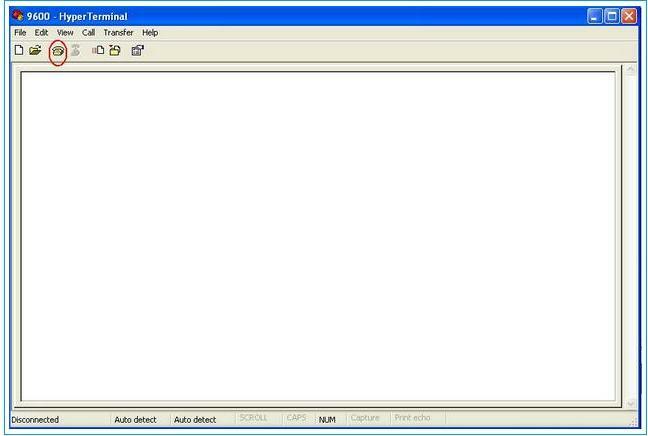 <Ctrl+z>When you finish entering the SMS message body, you have to enter the <Ctrl+z> character to mark the end of the SMS message body. 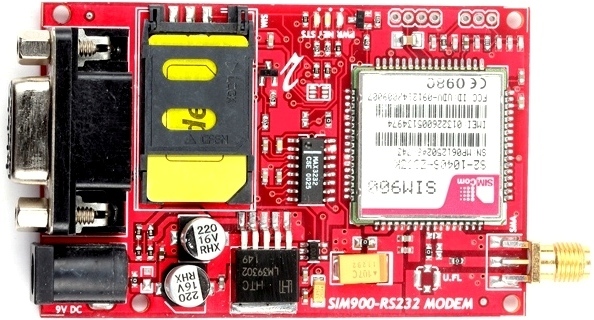 Now let’s receive a message using rhydolabz GSM/GPRS RS232 MODEM-SIM900A.For receiving message we need to first send related AT commands to initialize the modem. 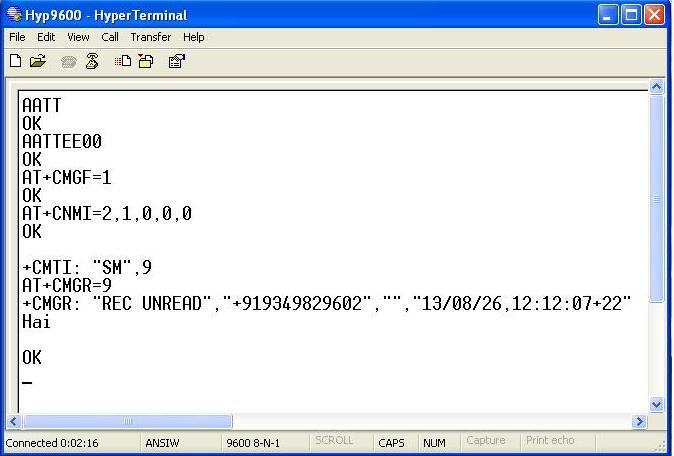 AT+CNMI=2,1,0,0,0 command (followed by enter) set the modem to indicate received messages with +CMTI response indicates that new message has been received and shows location number of last received message in above figure it is shown by number ’9′. AT+CMGR=<index> :<index>integer type; value in the range of location numbers supported by the associated memory and gives +CMGR response which includes status i.e “REC UNREAD” Received unread messages,Sender’s number,date,time and received message. For receiving call we need headset,connector jack and modem. 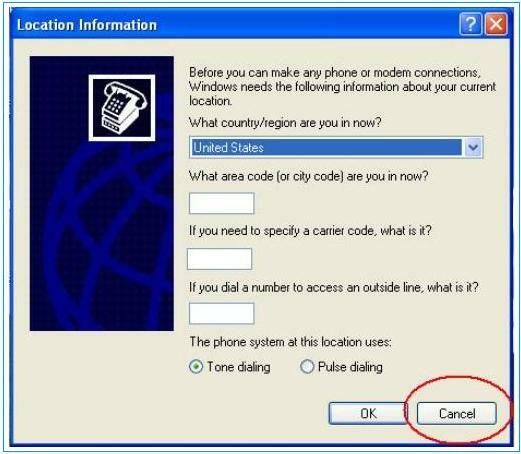 For receiving a call firstly we need to send some AT commands as shown below. 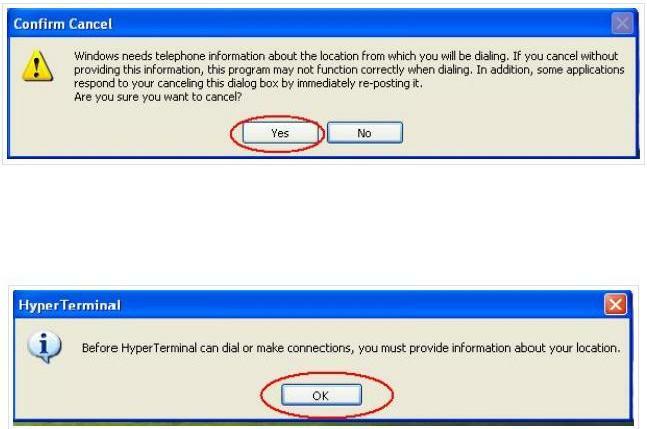 For Attending call we are using ATA command (followed by enter) gives “OK” response when call is connected. For Disconnecting call we are using ATH command (followed by enter) gives “OK” response when call is disconnected. 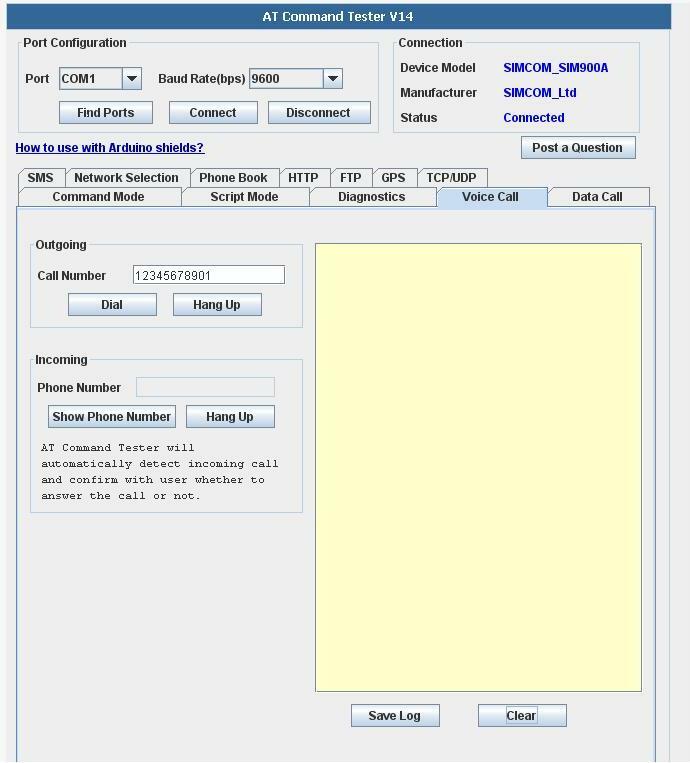 AT Command Tester is an online tool for testing AT commands and other module functionalities such as data call, voice call,HTTP, network registration, SMS, Phonebook, signal quality, SIM interface, device info etc. 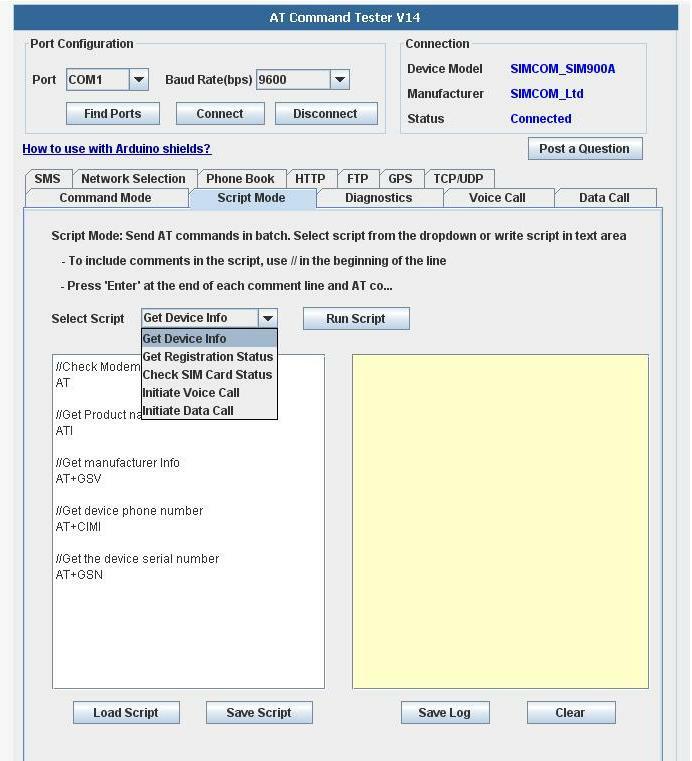 Firstly you need to connect your GSM Modem with your system. Here some example are shown using AT Command Tester. First select ‘Find Ports’ to search for available ports. Then select the modem port and press ‘Connect’. Once connected to the module, you can send AT commands from the ‘Command Mode’ tab. AT command (followed by enter) after “OK” response, this signifies that our Modem is working properly.ATE0 command (followed by enter) is being sent to stop the echo. In script mode, you can send multiple AT commands at a same time as shown below. 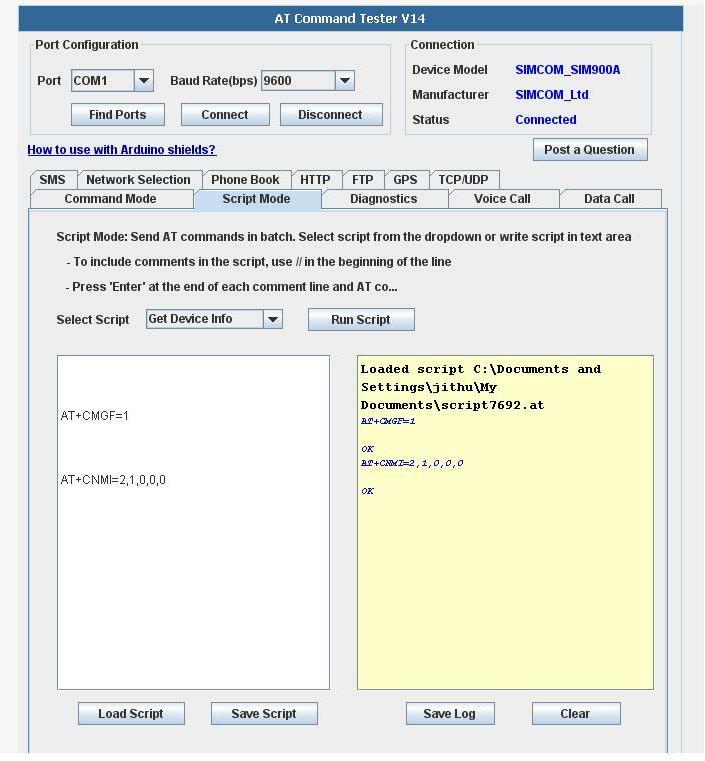 You can create your own script and save it on the local machine.Then load the script and execute. 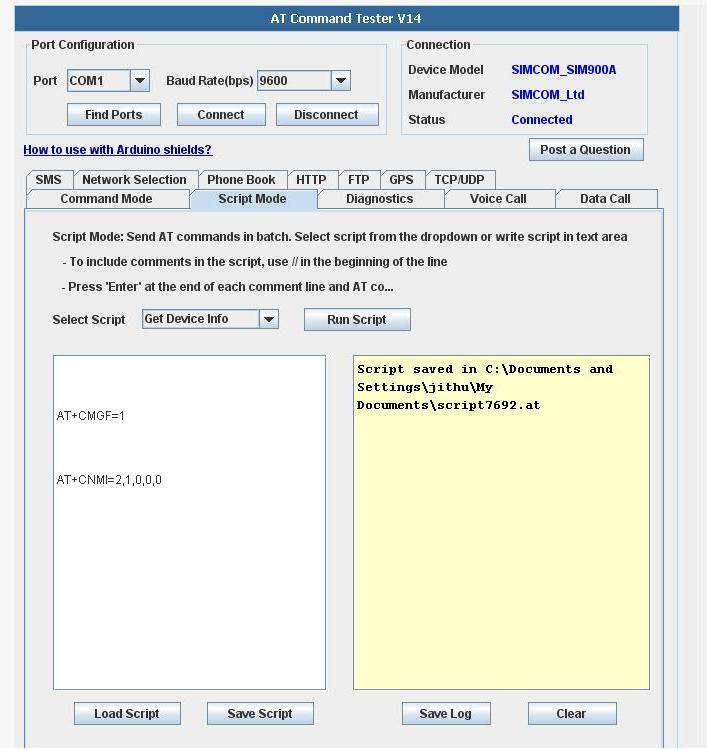 In script mode we can save necessary AT commands and if required than we just need to load that saved script and by clicking on Run Script we will get output in column provided at right side of the tester. 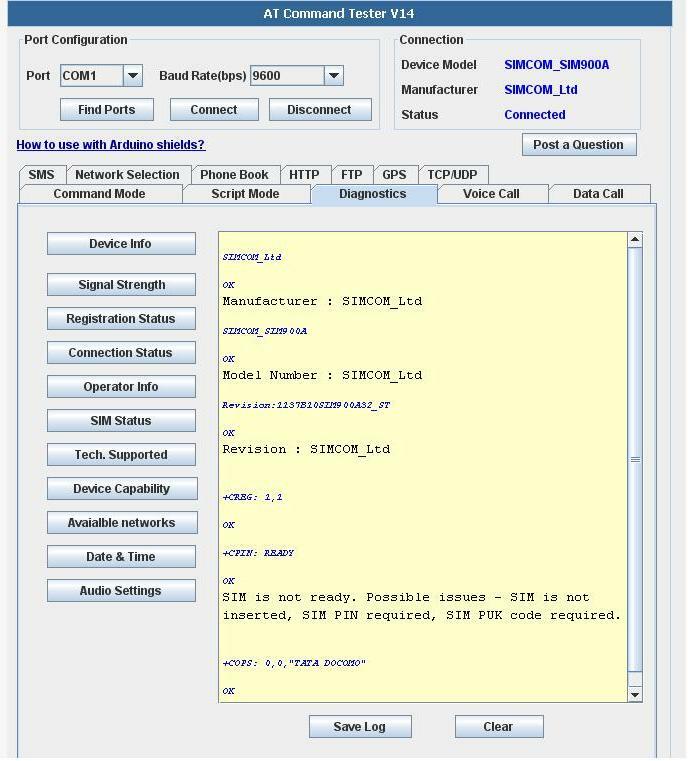 To perform basic diagnostics on the SIM900A module, choose the ‘Diagnostics’ tab. Select the ‘Voice Call’ tab to test outgoing and incoming voice calls. 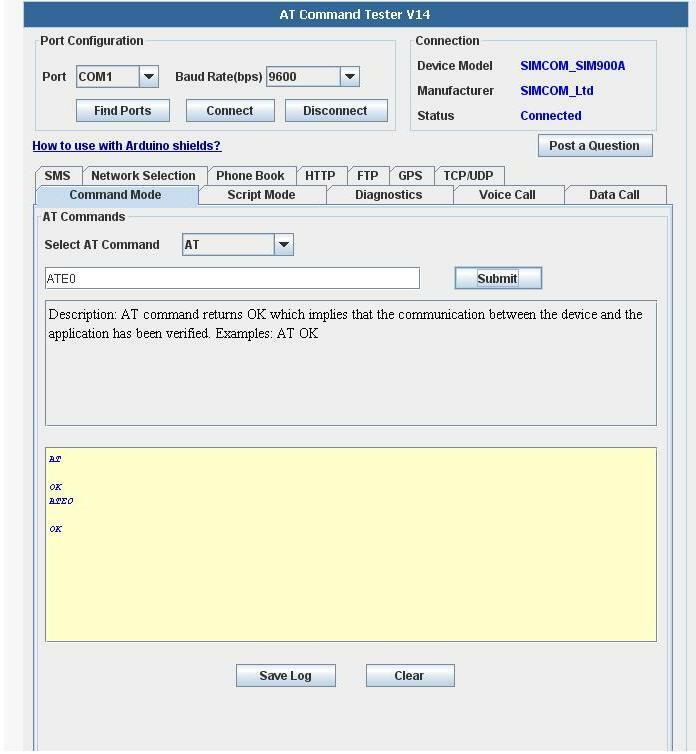 The ‘AT Command Tester’ will check whether the device is registered before dialing the call. Select the ‘SMS’ to send SMS messages. You can also read and delete SMS messages stored on the SIM. 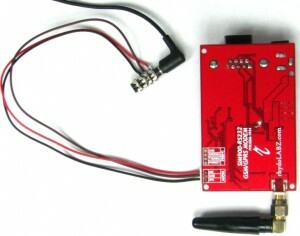 For making connection between GSM Modem and Arduino you may use RS232 – TTL ( 5V) Converter. Else While interfacing GSM Modem with Arduino you may need level shifter (MAX232 IC),because Arduino and GSM Modem works at different logic levels,connection diagram is shown below. When interfacing GSM Modem with PIC 16F877A need level shifter (max232 ic),because microcontroller and GSM Modem are different logic levels,connection diagram is shown below. Click here to buy GSM/GPRS RS232 MODEM-SIM900A. Click here to buy USB to Serial Adapter (DB9). Please share your ideas with us, visit our forum for discussion. Q. How much voltage is being supplied to the module ? Ans: Input voltage given to the module is from 5V-12V. Q. Why Antenna is needed in GSM modem ? Ans: Antenna is needed to increase gain level,to establish a communication. Q. Why sometimes we are not able to hear properly in Headset connected to the modem ? Ans: This problem arises because some times we forget to set loudspeaker volume. AT+CLVL=100 -Command is used to select the volume of the internal loudspeaker audio. Q. What the three LEDs indicate in the GSM modem ? NET LED (Network LED) -Blue LED will blink fast for few seconds(Searching For Network) and becomes slow blinking once the Modem registers with the Network. 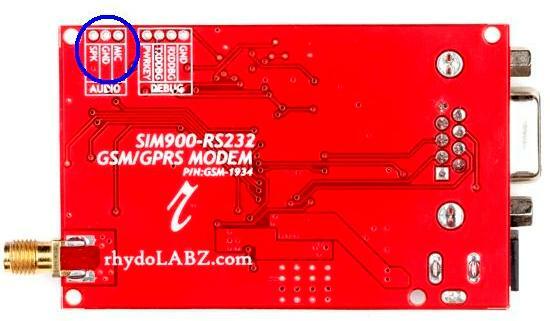 6 Responses to "GSM/GPRS RS232 MODEM-SIM900A"
How to interface of Sim900A with ATMEGA328 IC? 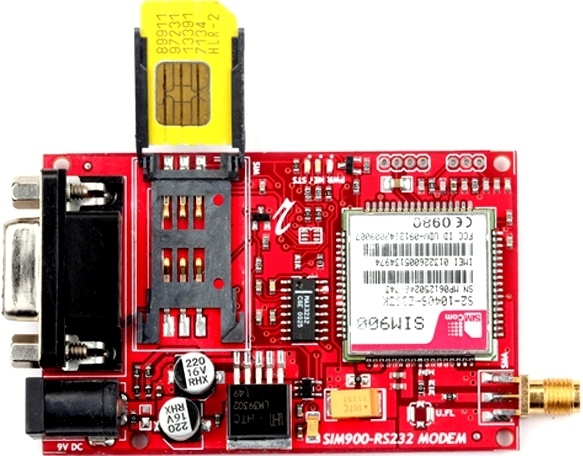 GSM/GPRS RS232 MODEM-SIM900A can communicate with ATMEGA328IC using UART protocol. Since the output from the IC is TTL, you must use a MAX232IC between the Modem and ATMEGA328IC. No,It is a 2g Modem.For 4G you want to use SIM7600EI modem.